This week shows no shortage of targeted attacks designed to extract large datasets from a broad range of consumer sites. Travel, finance and entertainment sites were targeted, impacting more than 100,000,000 unsuspecting victims. If anything, this week clearly demonstrates why individuals need to proactively monitor for their compromised data with tools like ID Agent’s SpotLight ID – Personal Identity & Credit Monitoring Solutions. The events of this week also clearly demonstrate why businesses must monitor for compromised credentials that can be used to exploit internal systems and to compromise or takeover customer accounts. Google Groups - taking a page right out of Amazon’s leaky bucket playbook? In other news…The City of Atlanta’s losing streak continues thanks to ransomware hacks! This time, the city’s evidence chain of custody breached, allowing police evidence to be destroyed - impacting investigations and prosecutions. Risk to Exploited Individuals: High: Social engineering and identity theft as a large amount of personal information including names, addresses and phone numbers of customers. Customers Impacted 26 million, and even more if you consider the customers who are unable to buy tickets while the site has been down. An important takeaway from this week finds its origin in research done by Dr. Michael McGuire, funded by Bromium and titled ‘The Web of Profit’: The unfortunate truth is that crime does pay. Cybercrime produces 1.5 Trillion each year, which rivals Russia’s GDP and would place cybercrime at number 13 in a comparison of the world’s highest gross domestic product. $500 Billion of that can be contributed to intellectual property theft and data trading accounts for $160 Billion. 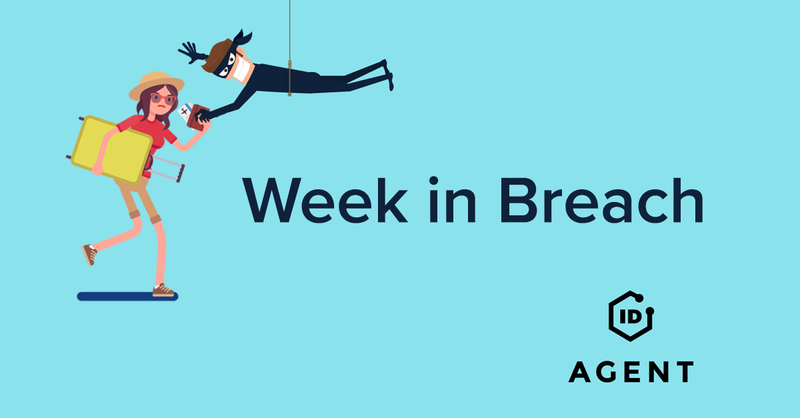 We're always very excited to see how our Partners are using The Week in Breach to educate their customers! Contact us at marketing@idagent.com and let us know! And if you're looking to see how Dark Web ID™ can help you protect your customers’ credentials? Learn about ID Agent’s Partner Program now!